This summer I continued my work in the robot soccer group of the GRASP Lab of Penn. Together with other undergraduate and graduate teammates, we competed in the 2013 international RoboCup (usually known as the Robot World Cup) in Eindhoven, Netherlands (http://www.robocup2013.org/), where we ended up champion of the Kid-Size League as Team Darwin and Consolidate Cup winner of the Standard Platform League as Team Upennalizers. As Penn’s robot soccer team, we program robots to play soccer autonomously. Early in April, when I was finalizing my summer plan, the team’s supervising professor offered me the chance to lead the undergraduates in the team and attend RoboCup. Even though I had been to the competition last year, the excitement was still fresh in my mind and the opportunity to sort of lead an academic group in college was a good challenge. Besides, a free trip to Europe was truly appealing. I decided to stay in the team. We spent two months preparing for the competition. 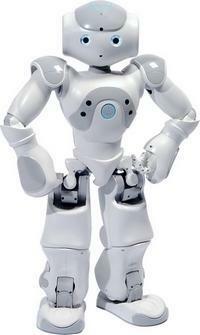 Before, there were two robot soccer teams in the GRASP Lab: the Upennalizers team, an undergraduate team which programs the Nao robots (see figure); the Darwin team, a graduate team, programs the Darwin OP robots (see figure). This summer, the two teams combined as one. Even though they competed in different leagues of RoboCup, they now shared the code base and the members worked together. The combination was a very time-consuming change. As the leader of the undergraduate team, my major work was to detect and fix bugs generated in the process and ensure good communication between the members of the two teams. Moreover, I needed to help the new members in the team to get familiar with the robots and the code. The RoboCup started on the 24th of June. As soon as we arrived in the Netherlands, we started last minute preparations for both teams. The Upennalizers team played in the Standard Platform League (SPL). This year, the SPL play field size was doubled and it became more difficult for the robots to detect the ball and other landmarks. Besides, most members in the team were inexperienced rookies. As a result, we did not calibrate our robots well and we lost the first game in the first round pool. We managed to fix the problem after that and won the following games, but due to the previous loss we had to play one additional win-or-die game to get into the next round of SPL. The most unlucky thing was that in this vital match we met last year’s third place team, who also came through an unexpected loss in their pool! The final result was a tight game and they scored one minute before the final whistle. We lost by 0-1. This was very disappointing, especially for me as a second year veteran, who took more blame for the failure. Last year as a rookie all I did was watch the Upennalizers win and learn from their success. This time, I learned more from failure: robotics is all about being more precise. Even a tiny discrepancy may result in serious consequences. You have to test until the last moment instead of assuming everything should be fine since it worked three days ago. The good news was that the Darwin team went undefeated in the Kid-Size League (KSL). Every game went well until the quarter-final, where the opposing team used our codes from last year! The Darwin team was the champion of NSL in 2011 and 2012 and usually releases part of their codes online. Somehow the other team managed to ‘steal’ all our previous codes. Under such circumstances where the two teams were using similar codes, the key to win is accuracy. With the lesson learned from the Upennalizers’ side, we were very determined and careful in pre-game setup, and the game started well with a 2-0 lead for team Darwin. However, soon our robots ran into power problems. Darwin OP robots were fast and stable, but their batteries cannot last long. Two of our three robots died on field at the same time and we suddenly found ourselves in a dangerous situation. The opponent, with last year’s champion codes on their robot, scored once. They almost tied the game when they missed an incredibly easy shot right before half time. Luck was on our side this time! We charged all the batteries and in the second half we ruined the game again. Finally we won that game as well as the following semi-final to become a finalist. The last day of RoboCup was hilarious. Both teams had a big game to play. For the Upennalizers, even if we did not get into the second round, we played in the “loser’s cup,” AKA the consolation cup of SPL and we got to the final. In the final game, we ran into a vision problem and were down by two goals again in the first half. During half time, we made some quick adjustments but the opponent made another score at the beginning at the second half. Honestly, at that time I was desperate. Then came the great moment: our robots found their way on field and scored four times in five minutes, giving us a 4-3 lead! Both teams were shocked and the audience went crazy. Fifteen seconds before the end of that game, the opposing team made a strong shot. The ball almost went in our goal but it stopped five centimeters before the goal line, and that was the game. The Upennalizers won the losers cup with an epic comeback – we were excited but we did not have much time to celebrate because the Darwin team still had its NSL final to play. The final was as thrilling. We started strongly with a 2-0 lead. However, one of our robots died of battery failure again and the opponent made three consecutive goals. They guarded their lead until half time. This time, as a team we did not panic and finished our robot maintenance work as usual. As expected, in the second half our robots became unstoppable as before. We tied the game and meanwhile our opponent’s robot ran into similar power issues. Even though they called a time out, they were not able to stop the pace of our Darwin robots. We scored another four times and finally won the game 7-4. Team Darwin has been named NSL champion for three years in a row! That is definitely a RoboCup record! After the big win we went on the stage, celebrated and took the trophy back to Penn. For me, the first half of this summer was unforgettable. I went through hard work, confidence, anxiety, failure and success. I have not decided whether to stay in the team for another year yet but at least I am glad to see many new members learned valuable lessons. 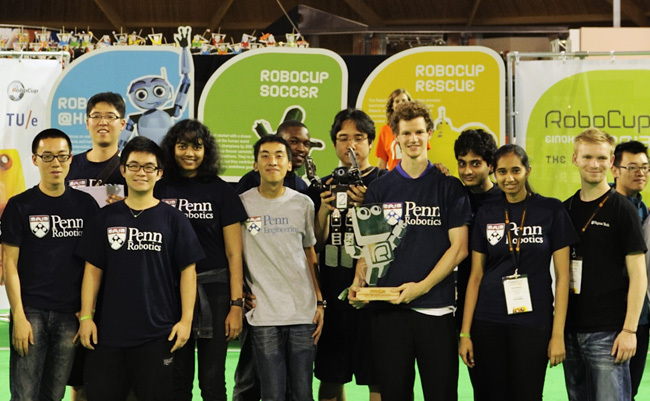 Penn’s robot soccer team will definitely stay competitive and energetic. Dickens is a current M&T junior in the Class of 2015. He studies Electrical Engineering within Penn Engineering and has yet to declare his concentration in the Wharton School.